Since 1984, M.C.M. 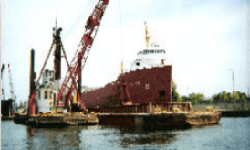 Marine, Inc. has been a premier contractor in all aspects of the marine Industry. Safety, Quality and on-time delivery are M.C.M. Marine's core values. Our large equipment inventory allows us to be one of the most diverse marine contractors in the United States. Our employees' experience, training and safety records are exemplary by any standards. Please feel free to contact us at any time for more information. Here is a short list of what we do. If you have specific questions, please don't hesitate to contact us.